It seems so fitting that about a month ago, a new store around Bonifacio Global City called Bird Box opened just when the hype of the Netflix movie of the same title was at its peak. According to its owners, though, the said movie was not the inspiration for it. Bird Box, situated at 9th Avenue corner Lane P (near Nike and Agave), is a business venture by five young professionals with full-time jobs. Their idea was to offer affordable takeout food in BGC where hefty-priced restaurants are usually found. If you’ve come across this store in BGC, you’ve probably noticed how friendly it looks! The store offers deep-fried chicken tossed in sauces for as low as Php149 with more than enough servings in one box. Most of the people working at the offices nearby really line up here for lunch. 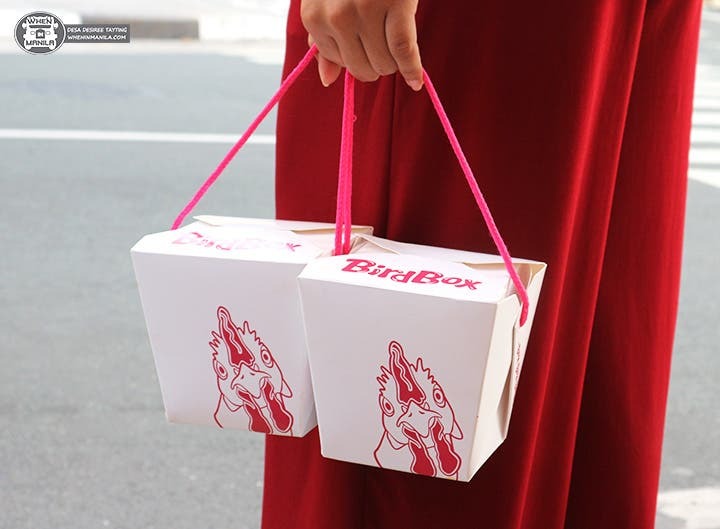 At Bird Box, you can create your own chicken box. First, you need to choose your base of rice or fries. Next, you need to pick sauce for your chicken – it can be Yangnyeom (Gojuchang, Tomato, and Garlic), Tebasaki (Soy, Mirin, and Ginger), or Kare (Curry, Roux, Onion). Lastly, you need to decide on your toppings: Shichimi (Japanese chili powder), Furikake (Japanese dry seasoning), Pickled Cabbage (which are tossed in a sweet and sour mix), Kimchi (spicy fermented veggies), or Onsen egg (soft-boiled egg). Yes, we know: every combo sounds good! If you’re finding it hard to decide on a combination, they also have signature sets that you can choose from. We tried them all! The Yangnyeom Set consists of fries, shichimi, and kimchi! Order this set if you are looking for a chicken meal that tastes Korean. 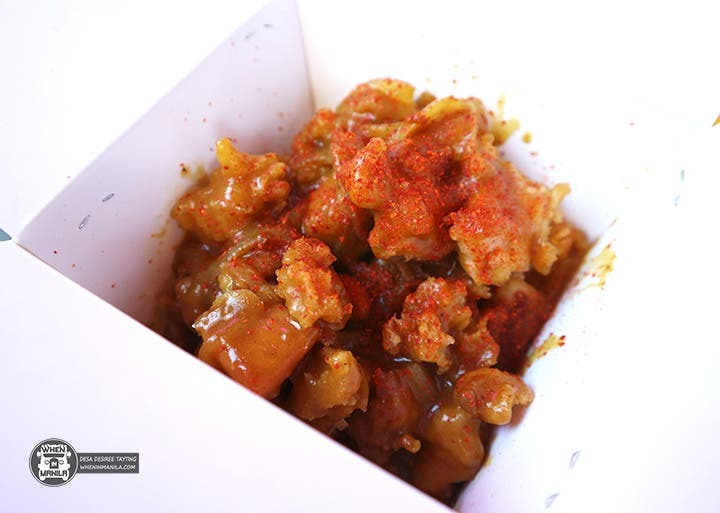 It’s flavorful and has a moderate amount of spiciness. We’re actually thinking of turning this into our go-to movie snack! After all, it’s served in a handy no-fuss box to boot. Next, we tried their Tebasaki Set with rice, Furikake, and the Onsen egg. We added some pickled cabbage on the side. The owners recommend to mix everything up for this set while the egg is hot and runny! The chicken’s sauce is sweet, making it ideal for kids. The whole meal is really tummy-satisfying. Last but not least is the Kare set, which has rice and Shichimi; this will really appeal to curry lovers. It’s full of flavor and the whole set has an ample amount of sauce that will last until the last bite. These are just their signature sets, but it’s also fun to try out different combinations! They also serve solo orders of chicken at Php299 and fries at Php89. They will also be adding beverages to the menu soon, so stay tuned and follow their social media for more news and promos! Broke in BGC? Yumchee Provides!